It’s smoothie weather! I’ve mentioned on the blog before that I don’t do smoothies when the weather is cool or cold. And in general, I actually try not to eat too many smoothies on an empty stomach. An acupuncturist told me decades ago not to consume ice cold beverages with meals as they squelch the digestive fires. The same goes for cold smoothies which also may cause digestive problems and cause you to feel cold – not a good thing when it’s cold outside. When the weather warms up, I am more inclined to drink a smoothie, although I still start my day with warm water with lemon. Something else I am conscientious about with smoothies is the amount of sugar they contain, whether the sugar is natural from fruit or dates or added concentrated sweeteners from cane sugar or maple syrup. So many smoothies are total sugar bombs and not a great way to begin the day (with a spike in blood sugar.) I try to think about what a reasonable serving of fruit is and add nothing more than that to my smoothie. What I wanted to share with you today is actually a FRUIT-FREE smoothie. Stay with me. This recipe is from Dr. Frank Lipman’s book, “How to Be Well: The 6 Keys to a Happy and Healthy Life.” Dr. Lipman is an advocate (like I am) of a low-glycemic diet. He also promotes good, healthy fats like unrefined coconut oil, nuts and nut butter, and avocados. 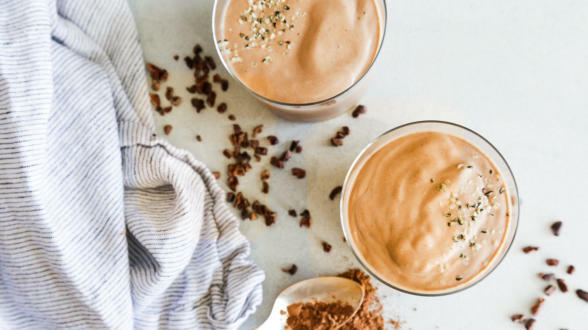 I originally tried this smoothie at the breakfast event I co-hosted for Dr. Lipman’s book in the spring and I was instantly smitten. What I loved about it was that it wasn’t too cold and it wasn’t overly sweet. I felt satisfied and full until lunchtime and I had no blood sugar spike and crash. Plus it tasted delish, like a creamy mocha delight! The addition of cinnamon has also gotten me addicted to the flavor of that spice with chocolate. It’s my new favorite. As always, there is room for adaptation here – sub sunflower butter for the almond butter or ghee for the coconut oil. There are even natural coffee substitutes if you don’t do regular coffee. Lastly, I’m not a huge fan of protein powders since so many of them are full of junk. I used the vanilla Vital Proteins collagen powder, but I’d love to hear what your favorite clean protein powders are! I love when you make recipes from my cookbook, my site and my online cooking classes. Please tag me @pamelasalzman #pamelasalzman on Instagram so I can see your creations! 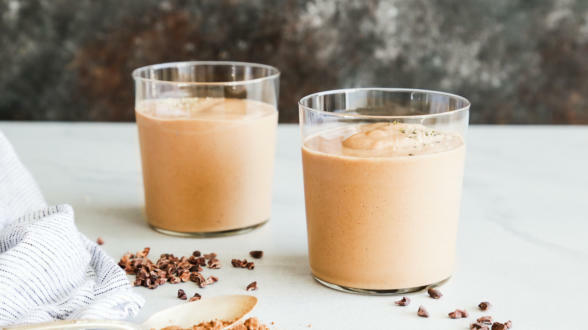 Chocolate Energy Smoothie from "How To Be Well"
This smoothie looks amazing! I can’t wait to try it. For protein powder I like Naked Nutrition and I buy it on Amazon. They have a few blends but my family likes Less Naked Vanilla which contains only grass fed whey, coconut palm sugar, and vanilla. It’s so good and not too sweet if you can tolerate dairy but they just introduced some vegan options too. I’m going to check that one out. Thanks! I use Nutiva hemp protein powders. Their vanilla one has organic cane sugar, so I use 1/4 of that and 3/4 of their plain one. It gives flavor without a lot sugar. It is also more affordable and easier to digest as it is one single protein source. Thank you for a great recipe without bananas! I know I’ll love it. My daughter loves an iced mocha, so this may be the perfect thing for her also! Sounds delicious! Can you suggest a natural coffee substitute? Anything instant? Yes! Pero is instant and available at my whole foods. It does contain barley though so it is not gluten-free or grain-free. Could we sub almond milk for the coconut milk? This sounds great. I’ve been wanting a smoothie recipe that doesn’t rely on bananas for consistency. Yes, many people have said the same. Hope you love it! I like the philosophie protein powder – very clean! Thanks, I’ll check that one out! Looks delicious! I usually replace protein powders with raw hemp seeds. To clarify- coconut milk from a can or a box? Thanks! Yes, same. I don’t buy protein powders and usually sub hemp seeds or nut butter. Coconut milk from a can. In this recipe, you could use coconut milk from a carton, but I’m not crazy about them since they have so many additives. 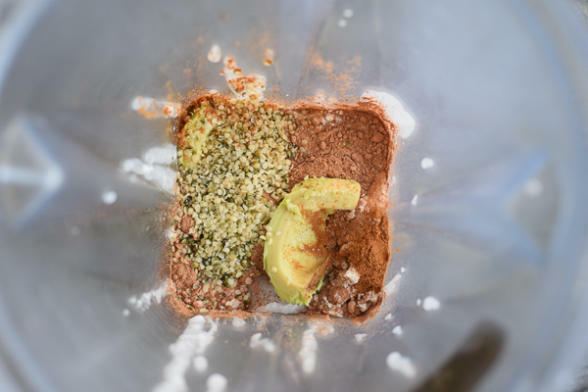 If you were to replace the protein powder for hemp seeds in this recipe, how much hemp seed would you use? Thank you! I would try 1-2 Tablespoons. The consistency will be a little different and you may need to add a stop or two of stevia to sweeten. Just taste and add your preferred accordingly. Thanks for the tip! I don’t know Epic. I’ll try it out. this looks delicious. all my favorite ingredients rolled up into one yummy treat! This smoothie sounds amazing! I can’t wait to try it this week.